Congressional proponents of the House Republicans’ tax plan, called the Tax Cuts and Jobs Act, claim that it will benefit the middle class. But in reality, it is a huge giveaway to the donor class—including a handful of top donors who have bankrolled the campaigns of Republican leaders in Congress. 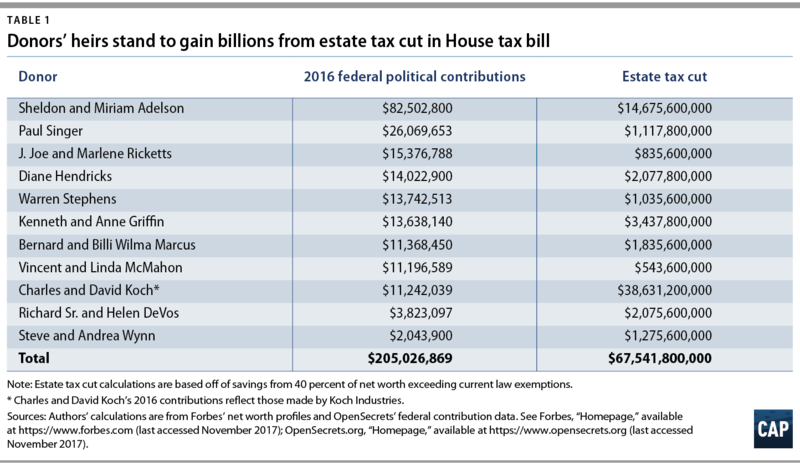 In fact, just the bill’s estate tax cuts alone would allow the families of 11 prominent donors, listed below, to pocket up to $67.5 billion. The typical U.S. family couldn’t earn that much in a million years. That’s not a figure of speech: The typical American family would have to work for 1,144,020 years to make the same amount of money as congressional majority leaders want to give away to the heirs of just these 11 wealthy individuals who helped them get elected. Taken overall, the tax bill would be a huge boon for the wealthy and large corporations, at the expense of everyone else. In 2027, 47 percent of the tax cuts would go to the richest 1 percent of Americans. Seventy percent of the gains from slashing the top corporate tax rate would go to the top quintile, and 34 percent would go to the top 1 percent alone. Meanwhile, millions of middle-class families would end up with a tax increase by 2027. Among the most egregious of the giveaways for the wealthy is the repeal of the federal tax on estates worth more than $5.5 million or $11 million per couple. This tax is only paid by the estates of the wealthiest 0.2 percent of Americans. The estate tax is a major concern of wealthy conservative donors, who would reap a significant windfall from its repeal. 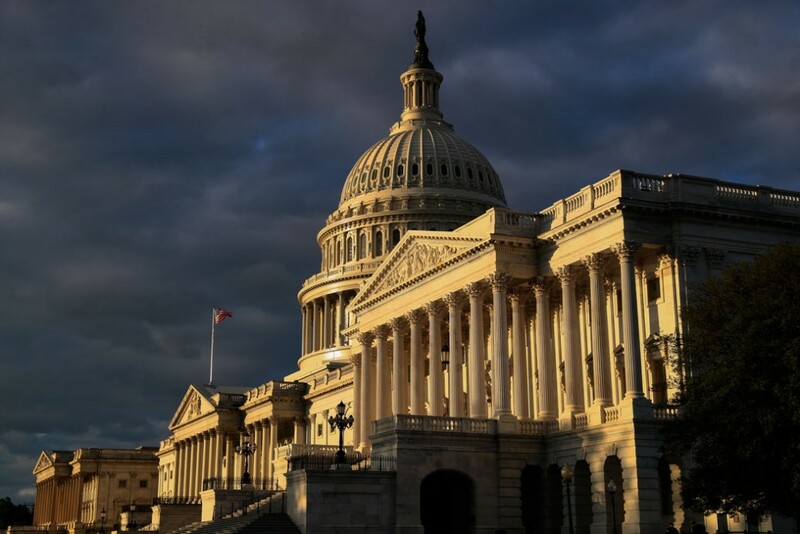 President Donald Trump has acknowledged that repealing this tax is particularly important to the very wealthy and said that wealthy Americans need it included in the tax bill. $67.5 billion is an astronomical amount of money. In fact, a family making the median household income of $59,039 would have to work for more than one million years to earn that much. 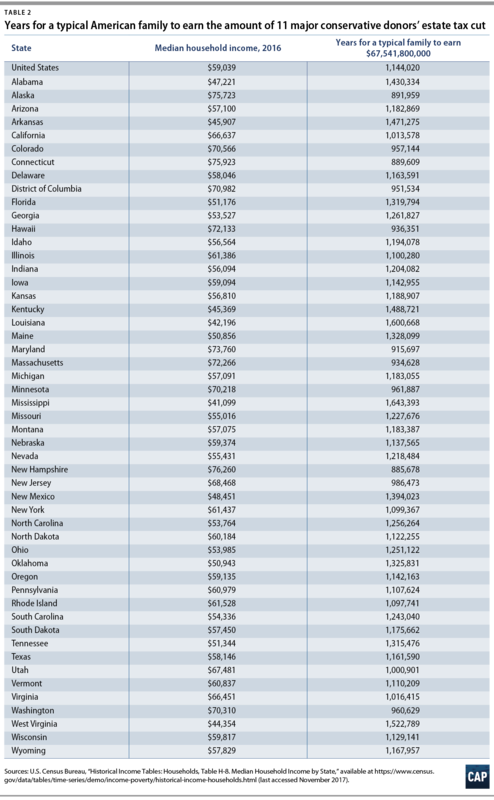 As Table 2 shows, it would take even longer in states such as Tennessee and Maine, where a family would have to work more than 1.3 million years to make that much. This giveaway to the donor class is indefensible. Trump and his allies in Congress have made it clear that they are looking out for their donors. The rich will get richer, millions of middle-class families will pay more, and congressional majority leaders will then argue they need to respond to the newly created deficits by cutting programs such as Medicare and Medicaid, just as the House and Senate majority did in their 2018 budget. When it is all said and done, working families will be left in a hole they cannot possibly dig their way out of—not in a million years. Galen Hendricks is an Economic Policy intern at the Center for American Progress. Sam Berger is the senior policy adviser at the Center.